Executive Pro Semi-Micro Laboratory Balance with Force Compensation By Precisa includes intuitive graphic interface, IR Automatic Sensor Draft Shield, integrated Applications. SCS Self-Calibration System. RS-232 / USB Interface. Optional: Bluetooth, Wi-Fi, Networking. Made in Switzerland. 125 and 225 gram capacity. 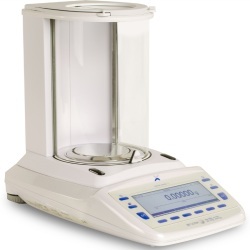 Semi-Micro Balances are extremely accurate weighing machines which can cost a lot of money. With the Precisa lineup of balances, you are able to enjoy high quality weighing at a fraction of the costs of the traditional brand name balances. Contact the sales team at Central Carolina Scale for your price quote today. Executive Pro Semi-Micro Laboratory Balance with Force Compensation By Precisa® includes intuitive graphic interface, IR Automatic Sensor Draft Shield, integrated Applications. SCS Self-Calibration System Standard: RS-232 / USB Interface with Optional: Bluetooth, Wi-Fi, Networking. Made in Switzerland. The EP Semi Micro balance performs to specification, all day, every day. And with features such as the unique hands free auto rotating draft shield, SCS self-calibration system and the intuitive user settable operation, the balance will handle any task you set for it. Executive Pro provides you with a comprehensive solution to demanding laboratory tasks and allows you to provide and capture critical results. The structured access to the menu and the clearly presented, easy to read, mult-lingual graphic display offers simplicity of operation. The IR sensor automatic draft shield operates effortlessly with a wave of your hand... either hand, allowing you to enter the chamber easily from either side. Integrated applications for laboratory and for quality assurance: pipette calibration, minimum sample weight, automatic buoyancy error suppression, density determination and many other applications..
Personalized Display Wide Range of Peripherals SCS Self-Calibrating System Made in Switzerland. The force-compensating measuring cell developed by Precisa is characterized by outstanding precision and durability. The cell is manufactured by hand to meet the strict demands that automated cell production cannot fulfill. Long term cost of ownership is minimal because the unit can be fully repaired on site. Precisa’s new advanced insert technologies, featuring the slide-in module, provide a range of connection options. The interchangeable inserts assure connection to future communication technologies, so your balance interface method does not become obsolete.